One of my most enjoyable, memorable and best vacations, was one I didn’t have to leave home to take. I called it – actually them, as there was more than one – my weekend vacations. I live in the heart of the largest rain forest in the northern hemisphere, namely the Great Bear Rain forest that stretches along the coast of British Columbia, Canada, and I am most fortunate to have many Provincial parks very close to my doorstep. Not many people know there is such a thing – almost everyone is familiar with tropical rain forests, but don’t realize there are northern, temperate rain forests as well. They are home to many diverse species – like the “Spirit Bear” of Northern British Columbia and Haida Gwaii, that don’t exist anywhere else in the world. Once, these forests stretched all along the coastal waters from California to Alaska. Just think - thousands of people pay thousands of dollars to escape the drudgery of bill payments, mortgages, grocery store lineups and rush hour traffic. Very few people stop to think that a short twenty minute drive can transport them to a lush, tropical feeling, serene get-a-way, where they can park the lawn chairs in the middle of a cool clear stream and wash all their cares away. One of our favorite haunts for weekend vacations is this river tributary that runs through a local equestrian center. 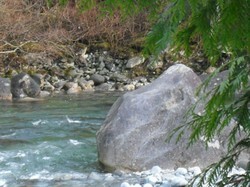 This spot is also quite popular for spending the day rafting or tubing. It has always been wonderful dreaming about Jet-setting around the world, sipping the finest beverages, wonderful cuisine and exotic scenery. I have been fortunate to see, what to me, are exciting and tropical vacation spots just south of my border, but not everyone has that opportunity or the finances to travel. For those of us who enjoy a bit of nature, campfires, and no, no one like mosquitoes - weekend, mini-vacations are hard to beat. With the economy not knowing what it's really doing, it can actually pay you to stay home! No matter where you go, you will be paying for high fuel costs, so why not enjoy your own backyard for a change, and give your local economy a boost at the same time. One of our backyard vacations took us to a little place an hour out of town where we got to enjoy the beautiful scenery on horseback. It had been years since I had the occasion to go horseback ridiing, and it was a thrill to be in the saddle again. At one point in our ride, I almost had the opportunity to go swimming - my horse slipped crossing a pond and the both of us nearly tipped over. Fortunately, I had a very responsive and smart steed who didn't question my authority when I reigned him in the opposite direction! He quickly followed my lead and the near dunking was averted. Even while enjoying our ride, I had to stop and take pictures when I spied this tree. I've seen many trees with fungus growing on them, but nothing like this one. It looked like a whole community had taken up residence and decided to build their own high-rise apartments! I've seen mushrooms clustered like this, but this was new to me. I would have loved to bring them home with me, but there wasn't any room in my saddlebags. I doubt I would have had room for them at home either, and I wasn't going to ruin the colony simply because I wanted one for myself. It isn't often that a novice photographer can snag a picture of water droplets, so when I spotted this tree fungus (sounds so appealing doesn't it,) I jumped at the chance. It wasn't raining when I took this shot, although it was around ten in the morning and the sun was well blocked by the neighbouring trees so the water hadn't evaporated. This particular specimen looked as if it was ready to eat anything that got too close! It's amazing to me that anything grows in these forests, as the trees are incredibly tall and the sunlight is so filtered, yet everywhere you look is green. Salmon berries and Huckle berries grow in abundance here and nearly everything is covered in thick, lush moss. If you tread carefully, you can easily creep up unwary hikers as the moss muffles the sound of your steps. I very successfully managed to sneak up on my son on one of our outings and scared the pants off him! The next time he tried that on me, but I was ready for him. Besides, it's hard to sneak up on someone who is always on the lookout for photo ops! Thanks so much katiem2 - you're so right about the kids - I have a ton of pictures of my son playing with sticks and branches and climbing over stumps while we walked the dogs on the trails. Such gorgeous photos, Enelle. You live in such a photogenic neck of the woods. I really love the dew drop photos!